I am a romantic girl, so I always search for cozy and comfortable place to sit and have a romance with someone special or even just with myself. I guess there is nothing wrong about having a romantic moment with myself. One of the searches takes me to Patio Venue - Trattoria & Pizzeria, an Italian Restaurant in Jakarta. But wait… Italian? Why the word Italian sounds more yummy than romantic? Okay, let's see what happens to me. LOL! Patio Venue - Trattoria & Pizzeria is located in a neighborhood where there are more houses than business buildings. It is a bit far away from all the noises, not in a crowded place. The location itself tells me that Patio is calm and relax place. When I walk into Patio, I am greeted by so many green plants and trees. Suddenly, I am falling in love with the garden around the restaurant. So cool, fresh and peaceful. This is a unique thing, because I rarely see a restaurant in Jakarta that is surrounded by a beautiful garden like this. Inside Patio, I can see that the interior design is very rich and classic. Some warm colors take a bigger part in the restaurant, and big sofas give comfortable atmosphere like the one in our home. A few of antiques give an elegant touch to the area. The ambience is awesome and beautiful. I think it is a perfect place to have both lunch and romantic dinner. As I sit in Patio near the outside garden, I hear jazz and instrumental music around the restaurant. The dimmed lights over my head add more romantic ambience. Yes, the restaurant is a very perfect place for a romantic dinner. In one corner of the restaurant, I can see clearly a representation of an Italian authenticity. It is the oven to cook Italian pizza! Wow! Suddenly I imagine of a thin crisp bread inside the oven that creates the aroma of pizza. Yum! Yum! Yum! Patio has private rooms for special meetings and occasions. The private rooms have fish ponds on the outside. This is awesome! Okay, enough for that! Let’s eat! When I want to make an order, the Waiter suggests me to take the Lunch Set Menu that has a complete package to satisfy my hunger. Well, I appreciate the suggestion, and that is what I take. Let's go and get them! The taste of the Tomato Soup is balance between its sourness and its sweetness. The texture of the Tomato Soup is rich and thick. A good one to start everything! 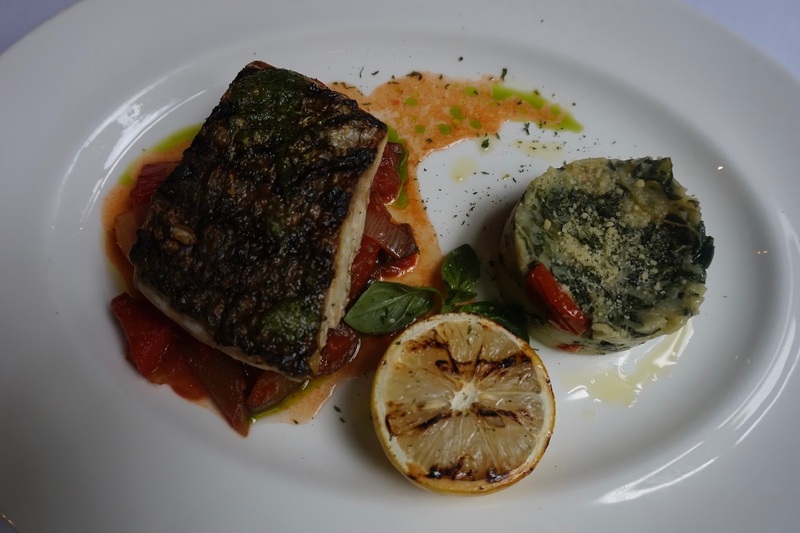 I pick Grilled Barramundi because I am a big fan of fish and seafood. The Grilled Barramundi is delicious. I can taste that the fish is fresh. It is cooked perfectly. The Potato with Spinach add more flavor to the Barramundi. Yum! To end the lunch, I get a very special treatment! I get the chance to taste all the desserts! Woho! This is great! My favorite ones are the Sorbet for its sourness, and the Creme Caramel for its bitter-sweetness and the richness of its texture. The taste of the Panna Cotta is quite light, perfect for those people who like light sweet dessert. When I look outside at the garden, I see something cute there. Hey! Patio has a red bird! It is a Red Cockatoo! The bird is friendly. She keeps looking at my camera as I take a lot of pictures of her. She knows that she is the center of attention and she knows how to pose. She might be a beautiful model in her previous life. Hahaha! I end the lunch with a peaceful feeling. I feel a little bit romantic too. So the next time I want to have a wonderful romantic lunch or dinner with a back to nature atmosphere, I will definitely go to Patio Venue - Trattoria & Pizzeria. Yes, I will be back. Have an awesome lunch, folks!